Top This: Talaria 43 Flybridge Edition Yacht Adds A Spectacular Vantage Point For Piloting and Entertaining. The Talaria 43 has been acclaimed since introduction for its extraordinary layout with an easy, wide-open flow from cockpit to helm, thanks to a revolutionary system of retractable glass at the aft end of the cabin. Naturally, Hinckley engineers got to work adding a flybridge but reserving this spatial arrangement as design target one. Mission accomplished. The Talaria 43 Flybridge edition yacht offers the same sporty layout enhanced by a spacious flybridge. Now, the captain and guests can socialize while enjoying the penthouse view. Seating aloft is arranged in a u-shape. Adjacent to the helm, even the captain can engage in the conversation. The settee is nested around a teak table and a Stidd helm seat is standard. A custom-designed mast, windscreen and stainless rails complete the picture. 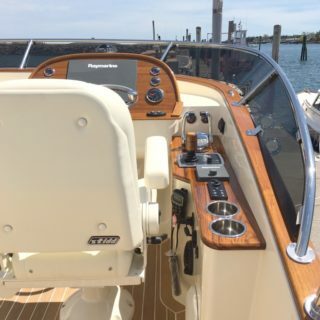 The weight of the flybridge has been kept down to offset her upgraded standard power, twin Caterpillar 650s. 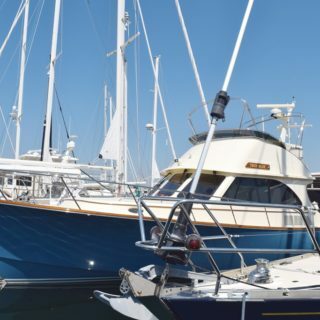 Rest assured, this means the Talaria 43 Flybridge easily keeps up with her motoryacht sisterships at a swift 29 knot cruise and 34 knot top end. 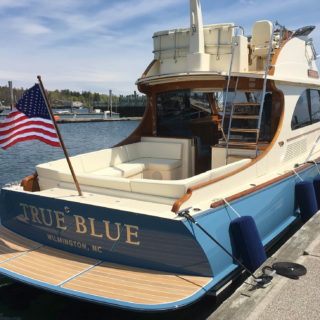 What hasn’t changed in the Flybridge edition? The spacious cockpit with seating all around. One level throughout salon and cockpit to make the space flow seamlessly. Between the interior and cockpit is an aft enclosure that disappears at the touch of a button. When the glass is retracted, the whole boat becomes a wide open express yacht with the feel of true sport boat. Closed, you have a fully heated or air conditioned retreat. For details on the Talaria 43 Flybridge Edition, click here.